Is 2018 the new 2014 for the Waratahs? It was a time to remember. A time when ‘Brexit’ sounded like a word one would use to associate with a dog biscuit. A time when everybody wondered whether Prince Harry would ever actually settle down. More importantly, it was a time when at least one of the Australian Super Rugby franchises could match and often better its New Zealand counterparts. Yes, that’s right, it was way, way, way back in 2014. We could be talking about many other ages of the past 20 years, but I’d like to draw a comparison with 2014 because it is the Waratahs that have once again shown similar promise. I recall that year fondly. The Tahs began and finished as the best side in the competition, with consistent results throughout. They were so good they did not draw criticism in regards to their coaching, skill level or results. Yes, it was a perfect season for them, capped off by a perfect performance in the final. Cue the keyboard warriors – and rightly so, because most of that last paragraph is false. Despite a great start and finish, in the final the Crusaders were allowed back in the game. Rugby rarely goes to script. Much like 2018, NSW in 2014 were heavily criticised throughout that year. For the first half of that season, most people were completely writing them off with their usual anti-Waratah bias. This continued right up until the eve of their grand final victory, when right here on this website, Scott Allen wrote a piece illustrating exactly why the Waratahs could not possibly beat the Crusaders. This was despite the fact that the Tahs had built their season nicely. They’d had a couple of bad results along the way but ultimately stuck to their guns, kept on improving, and were deserved title contenders and, ultimately, champions. Part of their successful 2014 season was an unexpected loss to the Blues, but the catalyst for that championship tilt was a game in Sydney against the Highlanders, when they blew them off the park by a then-record amount. I recall that season they went across the ditch and rang their cowbells in the dressing room before going out and hammering the Chiefs. It’s all starting to sound familiar? Perhaps with the Chiefs I am getting ahead of myself. My question is whether history is repeating itself? I am not locking them in as certainties for this year’s championship, rather, that for the first time since 2014, they could do it and so there is no reason as a fan not to back them. We as a fan-base need to see the team we support as a season’s entity. I don’t expect my side to be clear-cut favourites from the outset, I expect them to improve as the season progresses and from time to time have the odd hiccup. A 29-nil loss to the Lions will all be forgotten come July. I expect to look at other indicators, not just results, along the way to give me bearings as to whether this could be a successful season. Are they staying in an overall positive for and against? Are they scoring well-constructed tries? Have some of their losses been relatively close? When they’ve lost, have there been some statistical positives like run metres or possession stats? If the answer to most of these questions are yes, you can start to dream. 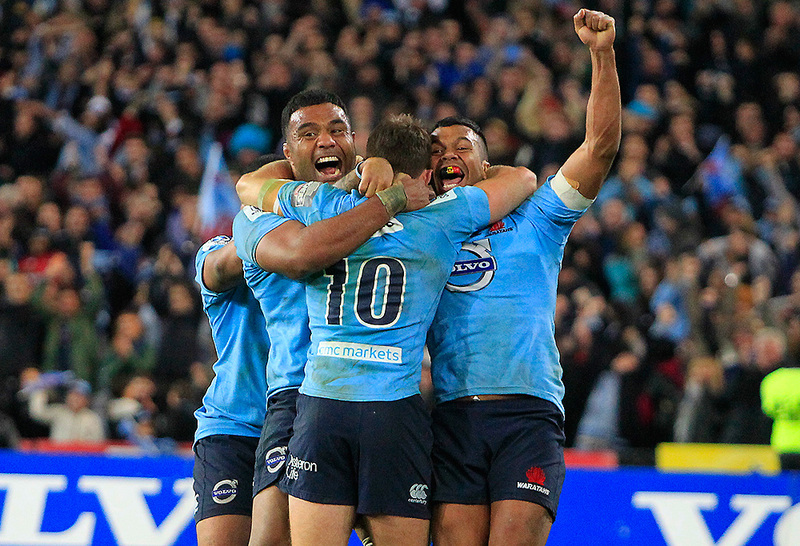 On that note, it is time to start believing in the Waratahs as genuine title contenders. Let the naysayers continue their negativity, but true fans should not let that stop you being positive. That’s what will draw the crowds and that’s how we can play our part. Sure, these past few games have seen just the one victory, but the fact they could have just easily been three victories, against teams full of All Blacks, is promising. I will go as far as saying that this is the best form the Waratahs have been in since the second half of 2014. They are demonstrating the same spirit, the same style of performance, and if they can keep improving, I can see them holding the trophy up once again. I may be right or I may be wrong. I don’t care. I’m just enjoying getting positive once again about their chances and I urge you to join me.